In the wake of Muhammad’s refusal to their overtures, the Meccans decided to remove the Islamic thorn from their Bedouin flesh. However, Muhammad, on the mundane level, would have had his own informers to alert him about the conspiracy on his life or, for all that, his sixth sense, of a survivor, sensed the impending threat to his life, forcing his flight from Mecca. Yet, in the divine plane, Allah, the All Knowing, might have come to know about the brewing plot to assassinate His Messenger, and He, not the One to be outdone by Hubal’s men, could have helped Muhammad in his flight, along with Abu Bakr, to Medina, the then Yathrib. While the Helpers of Medina welcomed Muhammad, the Jews of the neighborhood were scandalized by the ayats of the Quran. Indeed, they felt that the Prophet of Islam was plagiarizing their Torah in Hebrew as Quran in Arabic. Though the Jewish diatribes put Muhammad on the back foot, going by the hostility exhibited towards them in the Quran, clearly Jehovah was not amused. Thus, it seems the God’s alienation with His once Chosen People was complete, and that sealed the fate of the Jews who came to flourish in the oases of Arabia till then. However, unmindful of the Quranic warnings, which they dismissed as Muhammad’s ranting, the Jews continued in their tirade against Muhammad as an imposter. Besides, by making a common cause with the Quraysh of Mecca, and his enemies elsewhere, they had plotted for Muhammad’s downfall. It was then, ‘the God’ must have realized the dubious nature of man he created, and seemingly didn’t want to take any more chances with the flocks of Musalmans, His new favorites. Thus, ‘the God’ lost no time in stressing that the Musalmans are but the servants of Allah, and made their surrender to Him the raison d’etre of Islam. 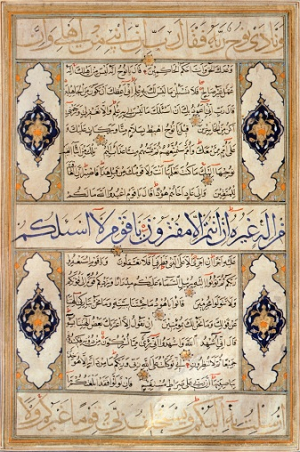 Besides, ‘the God’ fashioned the Quran to psyche the Musalmans into Islamic paranoia with Muhammadanic paraphernalia. And still, as though not to leave any loose religious ends, and to eternally bind the believers in the Islamic fold, Allah sought to inculcate in the faithful, the habit of unquestioning obedience to Him. Besides, combining the fear of hell with the promise of paradise, ‘the God’ took care to dangle the carrot and stick before the believing Musalmans. However, the God’s coup de grace appears to be in the psychological arena of the Islamic dogma. He sought to win over the compliance of the Musalmans by deriding the Jews and the Christians, the way a father harps on his hurt on account of his elder siblings to gain his youngest progeny’s sympathy. Like that father who wittingly or unwittingly imposes a psychic burden of obedience on his unfortunate son’s conscience, so ‘the God’ seems to have succeeded in inculcating a habit of mechanical supplication amongst the Musalmans to everything Islamic. Nonetheless, fearing that the prodigal Hebrews would tend to lead the new religious breed astray, ‘the God’ prohibited the Musalmans from having anything to do with them, and made a covenant to that effect with them in the Quran. With these, and many such admonitions in the Quran, ‘the God’ seems to have succeeded in sustaining a large body of Musalmans to this day who strive to follow the ‘straight path’ laid down by Muhammad for them. What is more, should they ever feel wanting in their faith, they tend to suffer from a guilt complex, and that’s what tends to induce, as would be seen later, an inimical abnormality in the psyche of the Musalmans. But, in spite of the creed of intolerance and the streak of aggressiveness that their faith unmistakably inculcates amongst them, there is this hurt in the Musalmans that the rest of the world considers Islam as anathema to the peaceful coexistence of mankind! Continued to "Czar of Medina"
Whereas in today's world there are those who do not believe in the existence of God, we have the Bible's word for it that the devil, evil personified, not only believes in God, but acknowledges God's supremacy as the Most High; notably, the devil believes in Christ, the Son of God, shouting this out through the host of possession - before being cast out - on numerous occasions in the gospels. It is a mark of the devil's pride to resist the will of God, as if proving a point about God; only proving, in this state, the withdrawal of God's grace. Acknowledging the supremacy of God is thus distinct from doing the will of God. This is something, as sinners, we are familiar with. In prayer, I acknowledge God is the supreme Good, whom I love with all my heart and soul; yet, I am daily a sinner. The doctrine of free will is based on the culpability of man, for if we are driven only by irresistible compulsions, how can we be culpable? - therefore, we have free will. Therefore sin is avoidable. In fact, the doctrine of free will is essential for administration of human justice. However, free will is distinct from freedom of action which is always determined by circumstances; the conflation of the two freedoms as one is the basis of human justice. The capacity to avoid sin, the believer to follow the will of Allah by his own will is what the Koran teaches. Christian teaching differs in stressing that only by the grace of God can a man avoid sin, the grace that has been merited by the death of Christ on the cross. I can only avoid sin if God's grace is active in me. My sinning proves a withdrawal of God's grace. In fact, we use the term 'disgraceful' for those acts that we would call sinful. I may have freedom of will to desire to do God's will - though this is itself by God's grace - but freedom of action is never mine. It is a continuation of all the limitations of my physical existence: I can only do that determined by circumstances. I cannot avoid sin through my own will alone; it has to be by the grace of God availing even in the nature of circumstances I am in. In the Our Father, taught by Christ, we pray, ‘lead us not into temptation, but deliver us from evil.’ Remove the inhibiting circumstances, even as a thought, differing for each man, and I find I am compelled to sin. The Koran is in error to expect man to follow Allah on the basis of acknowledging God's supremacy – the devil does as much and disobeys God - without the action of the grace of God in his heart, for which he should continually pray acknowledging himself at all times a sinner. The Koran condemns sinners, thus dismissing the reality of any action of God’s grace in the sinner's heart that causes him to repent. St Paul says, ‘but God shows his love for us in that while we were still sinners, Christ died for us’ Romans 5:8.